The nature of the financial services industry places a myriad of international compliance requirements on a company's IT team, as well as an expectation by its customers to deliver the high test levels of performance and reliability. To survive and thrive, businesses in the industry must not only keep pace with customer demand but gain competitive advantage. Those demands mean the IT team must be at the forefront of adopting emerging technologies. This is certainly true for Orangefield Columbus, who recently experienced significant growth in its multiple databases which led to the serious performance degradation of its existing storage system. 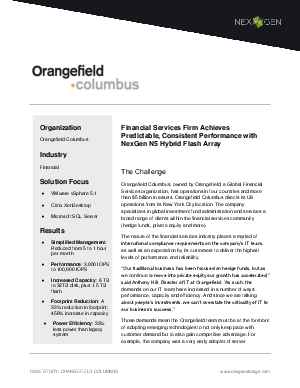 By focusing on a proactive data management storage array, Orangefield was able to eliminate resource contention. Download now and examine Orangefield's journey to find a solution that would meet, and exceed, their performance and capacity requirements.